School is getting ready to start and I am always looking for ways to get dinner on the table faster and with less of a hassle! I already make a menu plan for the week and try to stick to it. 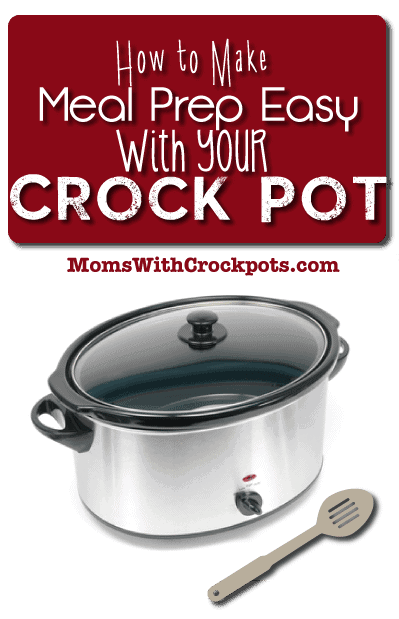 But there are some great tricks to prepping your meals for the week with your crock pot! Let it help you take the work out of your weekly meals! For those nights when tacos, chili, or other ground beef dishes are on the menu, have your meat browned and ready to go! Just place you ground beef into your crock pot on high for 3-4 hours (depending on your crock pot). Break it up with a fork or large spoon as needed. When done, drain, and place in meal size portions in quart freezer bags. Freeze until needed! I use cooked rice for a side dish, and when I make stuffed peppers. It is nice to have it pre-cooked for a couple meals in a row that way we aren’t waiting on the rice to get a meal on the table. I just make a large batch of this Easy Crock Pot Rice and store it in airtight containers in the fridge. This is a great way to get a head start on the week. We eat a lot of chicken on salads, for meals, in enchiladas, etc. I love cooking several chicken breasts in the crockpot and then using the meat throughout the week to save me time. You can just place the breasts straight in the crock pot or you could try this Citrus Chili Chicken. It is one of my favs. My kids love quick breakfasts, and delicious snacks. We love this Crock Pot Granola Recipe! I can make a big batch and use it to top yogurt, to just snack on, to make granola bars, and more. Plus it can be made gluten free! Do you have any tips that help you spend less time in the kitchen? Feel free to share them in the comments below!